Quick prescriptions delivered to you. You'll complete a short online health assessment and choose the medication you need. If you're unsure, our in-house GPs can also recommend the best treatment for you. Our doctors will review your order, issue your prescription and post it to you. Free Standard delivery is included. OR you can collect from any Superdrug store. Our doctors are based in a private UK office and only our clinical team can see your information. Your information never leaves the Superdrug Online Doctor servers, which are based in the UK. We host our systems with industry leader Rackspace, also used by the NHS Direct, British Army and Vodafone. Your prescription is signed by a GMC registered Superdrug doctor: FREE standard delivery. Your prescription will be delivered in a plain, unlabeled envelope. Doxycycline is an antibiotic, which is also used to prevent malaria. Malaria is a dangerous, potentially fatal, infection caused by a parasite. Taking antimalarial tablets such as doxycycline is an important step in staying healthy when spending time in a malaria risk area. With Superdrug Online Doctor service you can get a prescription for doxycycline online without having to visit a doctor. All you need to do is answer the questions on our medical questionnaire when you place your order. One of our doctors will review your answers and ensure it is safe for you to take doxycycline before issuing your prescription. You will receive your prescription via post. You can use your Superdrug Online Doctor prescription to buy Doxycycline at any pharmacy in Ireland. Use our online assessment to order. 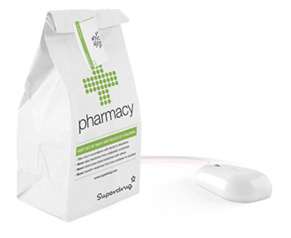 A Superdrug Online Doctor will complete your prescription and we'll post it to you. When taken to prevent malaria, doxycycline needs to be taken at a dosage of one 100mg tablet per day. Each doxycycline capsule should be swallowed with a full glass of water, whilst sitting or standing up straight. Take the capsule at approximately the same time each day. Allow at least thirty minutes after taking the tablet before going to bed or lying down as this helps prevent stomach problems such as ulcers. If you experience stomach pain or nausea when taking the capsule, you may find that taking it with a meal helps prevent this side effect. You need to begin taking doxycycline tablets two days before travelling to a malaria area to be protected. After returning from a risk area, you need to continue taking the daily tablet for four weeks. This is to ensure that the disease does not break out if you have been infected during your time abroad. If you forget to take your daily tablet, just take it as soon as you remember and then take the next dose at the correct time, but do not take a double dose if you have completely forgotten to take one dose. Doxycycline belongs to a group of antibiotics which can cause the side effect of photosensitivity. This means that while taking doxycycline you are more likely to get sunburnt. For the duration of your treatment, you must apply sunscreen before spending time in direct sunlight. You should not use a sunbed while taking doxycycline tablets. For a complete list of risks and side effects, please read the patient information leaflet. Alcohol and doxycycline tablets may interact, making the treatment less effective. It is therefore advisable to avoid alcohol during the treatment. Doxycycline is not suitable for travellers with a history of chronic alcohol consumption or liver problems. You should tell your doctor if you are pregnant or trying to become pregnant, or breastfeeding, as it could harm your baby. medication to stop blood clotting, for example, warfarin. medicines which contain aluminium, calcium, magnesium, iron, zinc salts or bismuth.